Now guess who's paying the Outlaws a visit? No, it's not the fictitious author, Walter Spivet. It's someone more grand. Who's always ready to lend a hand. Plus knows the difference between a sprocket and a divot. Oh! Wait a minute! That reminds me to call the super creative team of Writer: Scott Lobdell; Artist: Pascal Alixe; and Publisher: DC Comics in December 2012. I need some Walter. Jason doesn't like him. Roy wants to ignore him. And Kori transports the gang to a desert island just to get away from him. So without looking at the cover image provided: Can you hazard a guess as to who wants to have a word with our motley crew of outlaws in this issue, entitled, 'Up, Up And Away... My Beautiful, My Beautiful Balloon'? Yes! That's correct, dear reader. It's Superman. 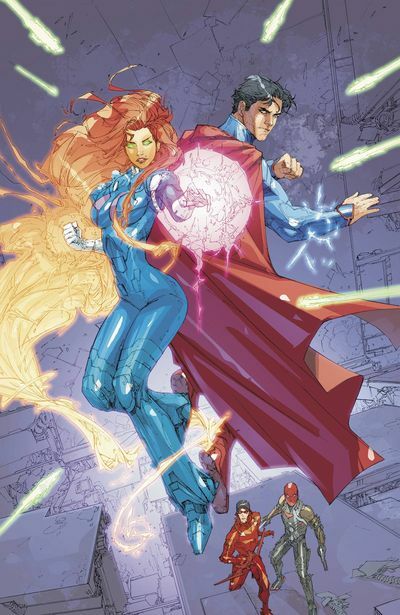 The last son of Krypton pay's our ever loving terrible-trio a visit, just so he can ascertain from Kori if some evil alien called 'Helspont' has tried to recruit her for his cause. Granted, 'The Outlaws' doesn't make life very easy for Supes to convey this message. Going so far as to punch him, zap him, and blast him up, up, and away. However, thanks to Isabel, he eventually manages to get his point across. Although I wished that I couldn't say the same thing about a grinning murderer, when Jason and Isabel go to Gotham City for a little night cap, sometime thereafter. Well, it desperately needed to be said by that particular point of the story, huh? There was too much silliness beforehand. There were three little nuggets of gold, tucked within this issue, that came as a nice surprise to me: Such as: (1) Batman's acknowledgement of the Outlaws was a pleasant turn up for the books. (2) I am intrigued to find out what Roy's brooding dilemma really is. And (3) As per usual, the jovial tone of this story is always a joy to plough through. But it felt even more so with Superman's cameo appearance. I can't help it. Maybe it's a 'me thing'. But it did slightly irritate me when the Outlaws never gave Superman the opening he needed to talk to them. Why? Huh? This makes no sense at all. Superheros aren't a bunch of bumbling brutes. If Jay and the gang care for people by protecting them, why not allow the biggest protector in the world to have a word? ART: ... Pascal Alexe's art complemented the whole bewilderment of the situation with his choice of stark panel layouts, aided and abetted by 'Blond's' seventies inspired colour pallet. Smashing job, guys. All of you made a fairly pedestrian scene into a bold looking and dramatic one. JAY: Sticking with this month comedic casting-call theme, I'd say Bob Saget is the only man alive who could kill you with his mouth quicker than the Red Hood could with his gun. ROY: If you look past the curly hair, the plastic surgery, and the age, I'm sure Carrot Top would be devilish enough to do this ginger archer proud. Let The F*cking Alien Speak! He Might Have Something Super To Say! Aesthetically this adventure is a tale of two half's. With one part a jovial misunderstanding, and the other part a dark looming battle. So, from my perspective, it has to be a low fat version of the Sammo Hung Kung-Fu flick, 'The Magnificent Butcher'. Good job. I'm sure that if it wasn't for you guys and girls, this book -- plus many others like it -- would never be distributed on time each and every month. However, there aren't that many titles like this one out there, huh? Off the top of my head, I don't think that I can recollect another comic which makes me happy and irritated whenever I read it (except for maybe the Justice League of course). Yeah. No word of a lie. This series is one of those series which is silly and sane at the same time. Take this month's installment for instance. Superman's confrontation with the Outlaws was bloody annoying on the page -- yet -- in the same breath, I liked it for its jovial tone. Try to think of it as getting ink-toner on your hands just after you've copied over a thousand pieces of paper-work. Happy that's the jobs done. Unhappy that you now have to clean your hands. Anyway, I best get a move on now; I have some paper-work of my own to do.